Home > Uncategorized	> Unique Blood Marks Explained? What was surprising and will ultimately be useful to many people is the experimental work done by Arthur C. Lind and Mark Antonacci explained in their St. Louis paper, Hypothesis that Explains the Shroud’s Unique Blood Marks and Several Critical Events in the Gospels. Our experimental approach was not to duplicate a miracle, but to show that natural methods by an artist or by natural contact of a linen shroud with a bloody body cannot duplicate what has been reported about the blood on the Shroud of Turin. To accomplish this it is necessary to better acquaint the reader with the properties of blood by using photographs because much that has been written about blood on the Shroud lacks the information that can only be fully understood by actual visual observations. Barbet very succinctly described the coagulation process as “Coagulation takes place in a very short time, never longer than a few minutes. Secondly, the clot grows smaller, exudes its liquid content, the serum. It then gradually dries.” This clotting process is described below using both words and photographs. It is, in essence, two papers in one. The first paper of the paper explains and defends Antonacci’s Historically Consistent Method and the second part is all about blood experiments. This is how the conclusion to part two begins. A variety of methods were used in an attempt to create blood stains on linen like those found on the Shroud of Turin. Some of the blood stains created in this research matched some of the reported features of blood stains on the Shroud. Other the blood stains created in this research matched different reported features. No one blood stain created in this research matched all the reported features. Reports frequently address the stains in a general manner without describing the exact location of the blood. Some blood stains on the Shroud were probably created from post mortem blood flow and others were not. Clearly any one blood stain created in this research would not be able to match all the blood stains reported on the Shroud. Also, the reported features do not describe both the forward and reverse details of any one blood stain on the Shroud to allow it to be compared with the many stains created in this research. Only Reference 2 has pictures of both sides of the Shroud (Figure 1 above), but they are not detailed enough for this research. Experiments conducted in this research revealed that accepted explanations previously reported for certain properties of blood on the Shroud are incorrect. Seriously, I do consider this paper as one of the most interesting paper regarding the “blood problem”. Looking again at my M.Evans collection, it is clear that the blood stains on the Shroud are not whole blood but serosanguineous exudates. I agree with Adler. This paper must be considered as a a starting point. Some ideas for new experiments with my own blood ? What about doing the experiments of blood transfers from hair to cloth. What would we see? Does it look similar to the Shroud, back and front? Remember, Dr. Gilbert Lavoie did a lot of this blood experimentation back in the 1980’s and his results along with photos are published in his book, “Unlocking the Secrets of the Shroud.” Art Lind collaborated with Gil for the paper he presented. Yes, Lavoie published some results a long time ago similar to what this paper is reporting and in this paper, Lind & Antonacci do mention that they are reproducing some of Lavoie’s result (even stating that Lavoie was the first one to do so). On the other hand, the main experiments that are lacking, and which is central to what is claimed in the first part of this paper and Lavoie’s claim, is some experiment of blood transfer from the hair to the cloth. Lavoie never reported such results and Lind & Antonacci do not either. These experiments are essential because it is claimed by Lavoie that the blood we see around the hair on the Shroud do not come from the hair. It would have supported this claim if it were shown that such blood traces we see cannot come from the hair. As for this paper, it is essential to do the experiment of blood transfer from hair to cloth because, if I understand Lind & Antonacci, one of their main claim is that the blood from the hair is transferred from the scalp to the cloth as the cloth “moves through the body” (I am simplifying, the claim is more complex, see page 8 of Lind & Antonacci’s paper). And this is based on the claim that hair cannot create the blood pattern we see on the Shroud. Once again, no experiment is done to show that this is not possible. I think it is possible, and some people can try it by themselves. I think the explanation is much simpler: the hair is compressed against the bloody wounds on the scalp and the blood seeps through the hair and makes the pattern of bloodstains we see on the Shroud. Before looking at blood transfer from the blood in/on the hair to the cloth, we must know how blood flows in the hair when there is an injury in the scalp. The answer: blood impregnates the hair locks whose roots are in/near the injury . Therefore any bloodstain in the hair coming from the crown of thorns must be consistent with the hair image. There are blood images in the hair (frontal side) which are NOT consistent with this fact. However, if this blood rivulet does not come from the hair but from the face (as shown by Lavoie and Adler, with experiments), there is no more problem. NOT consistent with this fact. 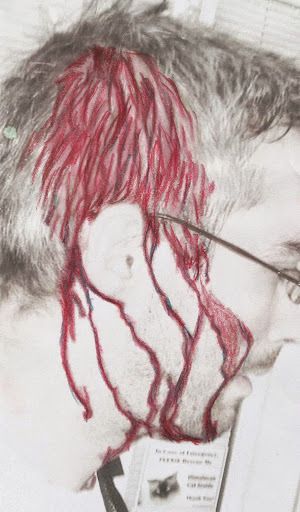 The blood comes both from thehair and side of the face, as suggested by Lavoie. This is evident when you make some proper measurements and some digital processing of the images. The lenght from the tip of the nose to the blood mark (around 9 cm) in the hair is perfectly consistent with what one would expect about the distance from the tip of the nose to the side of the cheek. This is Enrie image with bandings and weave pattern removed. It is evident there that dark areas between face and hair disappear, particularly on the left side (as it is obvious that the head is slightly tilted right). The face appears much broader. This is the effect of distortion, which IS INDEED PRESENT THERE. In reality, the hair of the Shroud Men are tightly bound to the sides of the face. We apparently see the flat projection, but this is nothing but the optical illusion. Thus the blood marks are both in the hair and on the cheeks. There are at least two types of bloodstains coming from the hair that should be considered separately. 1) The bloodstains that appear coming from pressure, such as the ones on the back of the head. 2) The bloodstains that appear not coming pressure, such as the ones from the front side. They do appear differently. Right? “There are blood images in the hair (frontal side) which are NOT consistent with this fact. The compressed explanation I gave, is for the back, not the front. The bloodstains you mentioned, coming from the front on the side of the face, cannot be coming directly from the scalp, because these bloodstains are far away from the scalp. They could simply be coming from the hair from blood that drips from the head into the side hair. I could should you such transfer, from hair to cloth by using a viscous liquid. They look similar as we see on the Shroud. As for the back, they do not look much like rivulets of blood. They look like compressed hair with blood in them that is pressed onto a cloth. I can show some similar transfer as well. Remember what is claimed, and what you wrote: “It is simply impossible”, which means that you have to show that there is no way these bloodstains cannot come from the hair. But I see no clear explanation (from Lavoie, Lind or Antonacci) of such impossibility and no experiment done. I want to emphasize this point because it is important: At no point in any of the papers written by Lavoie (probably 3 such papers in various publications like SSI) that he claimed that these bloodstains cannot (i.e., impossible) come from the hair. Some people may have inferred that, but that claim is never made. So, Lavoie never attempt to prove that point, which would be very difficult to prove because, again, simple experiments show that it is possible. Have you tried to put some blood (or viscous liquid) on some hair and pressed them on a cloth and see the result? The most important thing is that blood was detected on the Shroud. and both have to be controlled in a non destructive manner. Do you agree on that idea? Less (empty) talk please about AFM or CFM in 2015 pending some real ACTION. Yup, that’s the gear that we’ve been told is the answer to all our problems. Crowd-funding maybe? I’ll willingly chip in £100, on condition I’m allowed to see the equipment in action on a genuine TS image sample (shroudtstory calling Turin). If not – I’ll insist on a full refund. “Evaporation ” of my hard-earned cash resources (see current post) will not be tolerated. be more serious in your messages!! “Human blood clotting on linen…” But… Which kind of linen? Preliminar remarks about materials used in the research by Lind and Antonacci. we can see what is the difference with respect what is the Shroud. Another very interesting fact is connected with the chemical nature of linen threads used. For instance, I remember that P. Vercelli indicated me the use of Chlorite during modern bleaching. In any case they had to be more exact working with experiments. At least we have to do a contact angle experiment in order to know something about the behaviour of linen used (= water and blood absorption). In other words : they were incorrect (and I say that only from a textile point of view and not as silly and insulting remark!) in their experiment. Capillarity, warp and weft threads. In the same book (published in Italy by Effatà, in 2010) P. Vercelli wrote something about the observation about the reddish color that was more deep/intense on the points that evidences wefts which (having less torsion than warp) absorbed in a better manner liquids (fluids) that being in the furrow of drawing (and then protected) have been conserved. Vercelli added that publication of scanning for the reverse side of the Shroud confirmed these hypotheses because wefts are evenly stained and coloration appears more evenly than what results on front side. …and it is certainly not in this way that you can study in depth! Have you tried to treat linen with fumes of burning sulfur? Perhaps sulfur dioxide (= SO2) could be used in antiquity, but I do not believe in this hypothesis. As you see now I’m limited to the examination of the topic under consideration. Here I don’t talk about advanced analytical techniques (SPMs = the useful tools to know the truth !). Again, what Lind & Antonacci missed to consider: the possibility of images of bloody wounds (e.g., whip slashes) vs bloodstains themselves. For example, their discussion of bloodstains on the shoulders (back image). Are we seeing real bloodstains or images of the wounds? 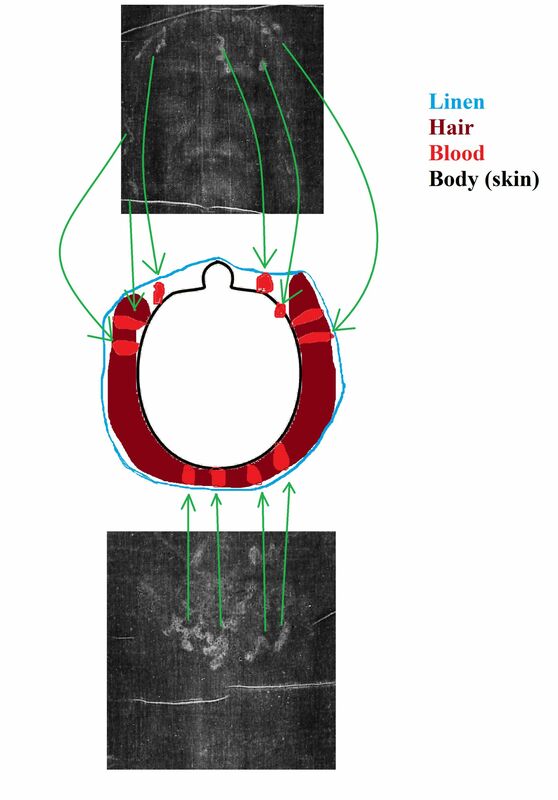 An very important observation that was not noticed and pointed out in that paper: on the recto image, taken in 2002, of the back image, there does not appear to be bloodstains on the shoulders, although that paper claim that there are. This is an essential crucial point of all their discussion. They are extremely (!) extraordinary claims made in that paper! Do people on this blog see these? Before making such extraordinary claims, basic fundamental observations must be supported in that paper. They are not. That completely destroy almost everything else claimed in that paper. The related portions of part 1 of this paper/discussion are built on various assumptions, creating a type of reverse domino effect: “the identification of human hemoglobin, human albumin, human whole blood serum, human immunoglobins, and human DNA from the man’s blood marks”. Should be some clarification here: human, human, human, etc. Was this truly demonstrated? Cross-reactivity in immunoglobulin, albumin studies precludes a definitive answer from the data. Adler was appropriately cautious in his interpretation (at least primate). This goes beyond that. Opinions, assumptions have to be screened out. Relatedly, the above sentence refers to “human hemoglobin” Was the hemoglobin characterized relative to species in these early studies? Human whole blood serum-again, species characterization-how? Finally, “DNA from the man’s blood marks”. Is this a scientifically valid statement? What specifically demonstrates that the DNA is from the blood marks of the man? One can’t and shouldn’t push the data beyond what it objectively shows. Part 2 illustrates the complexity of variables that exists in trying to re-create a collection of unknowns. Unknowns on the transfer or application of blood. Unknowns on the potential effects that the cloth may have on the results. Some combination of the two. Multiple potential variables could be involved. These are general observations-I enjoyed Dr. Lind’s presentation at the conference. You can refer to me as Louis (if you are allowed to) as I a human, not Yahveh to be addressed as YHVH. where two questions and responses dwell on DNA. Your opinion is important because you are an immunologist with a Ph.D and one response in the interview says that human DNA examinations have been conducted. We do not have complete details, and all I know is that the material was examined in a laboratory. Do we need a peer-reviewed paper on this examination, or is more needed? IMO, whoops sorry, In my opinion I believe we need both. As a former research scientist, I cannot imagine not wanting to write up original research with the goal of publication in a respected peer-reviewed journal. This is how I was trained. Among professional scientists, if it isn’t published it basically doesn’t count, or at least you don’t get credit for it. And that’s just where it starts, whether it’s valid or not, time will tell. Peer review takes some knocks-it’s not perfect, but it’s the respected, established system among professional scientists. A key step in Shroud science gaining more credibility, respectability is the publication of new, original research in peer-reviewed scientific journals. The best approach a scientist can undertake with his or her particular hypothesis/idea is to try to design experiments to prove themselves wrong; it broadens one’s objectivity to play the devils’s advocate regarding his or her own research. Subjecting your work to peer-review is part of this-Ideally, it is continually ongoing (with the primary investigator and him/herself & colleagues) as the research progresses and develops. I think it is great that the possible information that could be gained from DNA analysis is being considered. Contamination, degradation could be challenging issues, but one doesn’t know unless one looks-this seems especially relevant given the advances in molecular biology in the past thirty, even ten years ago. How do we know when the DNA was deposited? It could had happen at any time within the last 2000, or if you perfer 700 years. Why do you think they are so careful at a crime scene? “L” can also mean “El”, the deity from whom Yahveh seems to have been derived. I am very busy right now and will reply to you at the end of the day. Thanks, Kelly. Like much of what goes on in the realm of Shroud studies this part of the research has also not yet been revealed and one can hope that we will have a peer-reviewed paper to read soon. As you rightly pointed out, it must be proved that it is human blood. I personally believe that it is since who worked on this was Dr. Alan Adler, a serious and respected scientist. With your qualifications you are the right person to continue his research and I would be the first one to suggest including you in the team that Turin may form in the near future for another hands-on examination of the relic. Unfortunately so many things have come to a standstill in Shroud research. I have had to postpone delving more deeply into the medieval part of Shroud history, having gathered just half of the material needed and waiting for the other half — it is very time consuming when one has to depend on the availability of documents of the period to read and interpret — to fill the gaps in order to present a convincing picture about the impact of the Shroud on notables during the period. 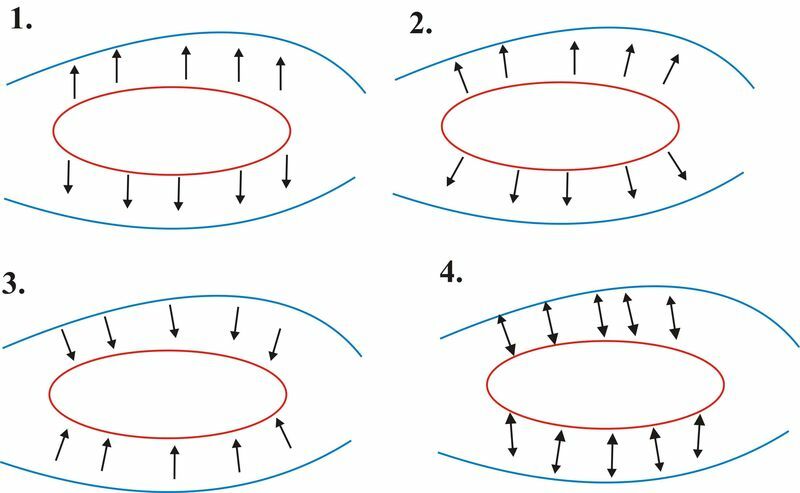 One is forced to change direction for the time being, so there should be more news — and views — about the image formation process next month. The most relevant marks are those on the nape because they cannot be moved out of the hair. I think some experiences and enquiries are not difficult. 1. 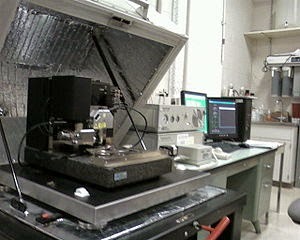 Simulate a transfer with some kind of liquid similar to blood. It is easy to put the liquid on the scalp and let repose the head on a cloth of linen. I bet my neck that the result is not remotely similar to the Shroud. 2. An enquiry with forensic independent experts. 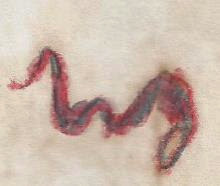 Dr. Baden said that these marks of blood were impossible. Perhaps other experts can show some examples a contrario sensu, where the blood runs on the hair and is transferred to the cloth in a similar way to the Shroud. I am surprised that these simple things had never been done in a century of modern sindonism. I’ll look forward to the results of your experiments. I’ve never been that convinced by the blood on the head. I think it was added on. I do not think this in anyway compromises a notion of authenticity for the image and possibly other marks. people tend to look at the shroud in black and white terms. 1-“If I had to go into a courtroom, I could not say there was rigor, whether the man was alive or dead, or that this picture was a true reflection of injuries. In no way do I hold myself out as an expert on the shroud, but I do know dead bodies. 3- “When the scalp bleeds, it doesn´t flow in rivulets; the blood mats on the hair. To me, this makes the image less real. It´s all good to be true”. (Relics of the Christ”, Nickell, p 174, 2007). 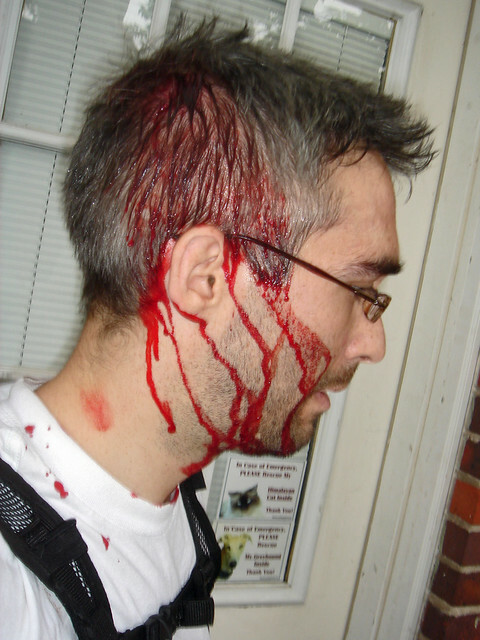 4- “Whatever did this doesn´t speak for severe scalp lacerations”. (Relics of the Christ”, Nickell, p 174, 2007). 5- “..if the Shroud is genuine, the body must have been washed”, “..if the body was washed there might be some oozing from the wounds”. “The Man of the Shroud was washed”. Zugibe, Frederick.T, 1989. The most relevant marks are those on the nape because they cannot be moved out of the hair. Which? On the picture below, I cannot see any major bloodstains in the nape area. Me refiero a la fotografía que muestra O.K. Creo que es un “problema” resuelto muy brillntemente….. Lo agregaré a mi blog…. This is a paradigmatic example of collective blindness. Carlos doesn’t see any blood on the nape (“Nuca”, Carlos. O “parte occipital del cráneo”, si lo prefieres)”. And OK presents here a big area soaked. The blood trickles of the picture run straight down only when they reach the skin without hair. And not one takes the form of spiral going from right to left. All these big differences independently that we are not seeing the marks on a cloth . Brilliant!… farce. = Così è (se vi pare). Baden made by rainwater does not speak about the nape, and the streams are seen perfectly in the hair. Baden no habla de la nuca, y los regueros se ven perfectamente en el pelo. Tranqui, Carlos. Take it easy, Carlos. I don’t invent anything. Dr. Baden said that blood rivulets on the hair never run as those of the Shroud. Hair is hair in the front and the back of the head. What is impossible in the front is also impossible in the back. (Do you need the Spanish translation?). I have made stand out the forms of the wounds to emphasize the difference in the forms. Everybody can see that the top of the real wound is expanded in a big stain and binds together little soaked locks of hair. And then, the trickles run on the skin in a straight direction blending each other. By no means can you match the actual injury with the curly forms of the rivulets in the shroud. If you go on to say that they are the same thing, I have nothing to add. Così è (se vi pare). You wrote:”There are at least two types of bloodstains coming from the hair that should be considered separately. And: “The compressed explanation I gave, is for the back, not the front”. I agree. I was speaking about the rivulets seen on the front side in the hair. The bloodstains on the back of the head seem to be much more realistic. As I wrote, ” blood impregnates the hair locks whose roots are in/near the injury” . This is perfectly seen in the beautiful photo from OK above. Look at the blood in the hair versus blood on skin. The blood imprints seen in the hair on the front side are compatible with blood on skin but not with blood on/from hair. My thoughts: what we see on the back of the head is the contact imprint of some hair locks full of blood. And if you have some “hair to cloth” transfer experiments, can you show them? I have to think about that !! Nothing to thank me for, Kelly, I mean what I say. Sometimes God drops the right people in the right place, in this case the realm of Shroud studies. You have a mission, it seems. There is so much to do, book reviews, translations, articles to write, but hopefully there should be something online about the image formation process next month. You wrote « The bloodstains on the back of the head seem to be much more realistic. So, how do these blood stains come from the scalp and not from the hair according to Lind & Antonacci? The body dematerialize and re-materialize: the transfers of blood is not occurring by “simple” contact, but when the body dematerialize and goes through the cloth, then when the body materialize again (resurrection)! This is essentially Jackson’s hypothesis. This is very far fetched (with all respects to the authors). Did you notice that general theory to explain the blood stains in their paper? Again, the main problem is the following: This scenario (i.e., body disappear and reappear), as presented in that paper, is based on the assumption that the blood stains cannot have been produced by simple contact from the hair. This point is a fundamental premise that must be proven and discussed before going any further. But this point is not even discussed and nobody has ever proven that point (again not even Lavoie ever discussed at length that point and proved that the blood stains cannot come from the hair). This is major flaw of this paper. You made the statement that the rivulet-looking bloodstains we see from the hair, from the front, on the side of the face cannot come from the hair. Any proof of that? How can you prove that? I think the burden of proof is on the person making that claim. Of course, blood does not typically behaves the same if it is transferred from the skin or the hair. The main difference is that the density of blood that can be transferred, if no pressure is applied, is going to be larger from the skin when compared to the hair. This is exactly what is happening when considering the photos taken from the recto (underside) of the Shroud, in 2000 (See “Shroud Images 2000”, published by Editrice, 2001). From these images we can see that all bloodstains from the hair on the sides of the face, in particular the rivulet ones, did not penetrate through the cloth, as far as it is possible to see from Fig. 5 of that book. That means that a smaller density of blood transfer occurred at these locations, which is coherent with a transfer from hair, not from skin. All blood stains coming from the skin in the face transfers as coming from the skin. This is an import point to notice when discussing the blood transfers of hair vs skin. And, there is nothing extraordinary about these rivulet-like looking blood stains in the hair. I see them as, for example, simply locks of hair with blood on them that slightly touch the Shroud. I could produce some photos of such transfer, but they will be very simple and nothing special (I did some many years ago). What does prevent this possibility? It is quite straightforward. I’ll read carefully your comment tomorrow. But today, as everybody in France, I am to much shocked by the ultra-violent terrorist attack in Paris. Yes, a terrible terrorist attack just happened in Paris. Solidarity to the French people and nation! Ma solidarité avec les familles des assassinés et le peuple français. Parce que les terroristes n’ont pas seulment tué des gens, mais attaqué un des fondements de la démocratie, la liberté de presse, qui appartient à tous. J’ai lu ‘Charlie Hebdo’ des que j’etais trés jeune (Wolinski ètait une référence à l’époque) et je suis bouleversé aussi. La haine de ces gens est impuissante mais elle fait du mal. Il faut ne pas se taire jamais. The “blood stains not coming from the hair” is not an assumption, it is stated as true in their paper. Also, there is a technical error in that paper about the first complete photograph of the underside. It is in 2000, not 2002. It was done also in 2002 but we have a complete Shroud photography of the underside made in 2000 (by Gian Carlo Durante). On reading this comment an hour ago, Mario, with its reference to Gian Carlo Durante, I was minded to ask if you might tell us the story behind your amazing Shroud Scope, especially the Durante images. Am I the only one to have puzzled how you managed to navigate your way round copyright issues without having legal writs flying everywhere. But I decided first to google “Gian Carlo Durante”, it being the first time I’d seen his first two names, and quickly came across this fascinating pdf that documents the controversial 2002 restoration. Tucked away inside is a heart-warming sentence that Gian Carlo Durante generously waived his copyright on his 2002 photographic archive, leaving Turin and the Holy See as the sole owners. One’s tempted to say more, a lot more, where copyright on photographic images of the TS is concerned. Frankly I’m amazed that private individuals with camera equipment, no matter how respected professionally, were ever allowed to acquire copyright anyway for what is surely a technical operation only. All that was required of them was to make as objective as possible a photographic facsimile with no obvious creative input that would aid further research. Nuff said (for now at any rate) except to repeat that request to Mario to provide an account of his ‘coup’ in transferring the Durante image to the public domain (a click away on our laptops). Thanks too to Thibault Heimburger, who was able more recently to place the still-copyrighted Mark Evans archive onto freely-downloadable pdf. Is that the complete archive, or are there images that we have not seen, especially of magnified close-ups of blood and image areas? 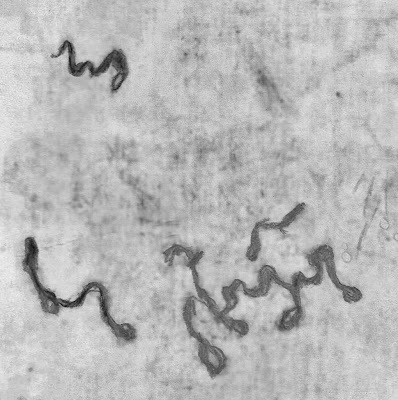 The Shroud Scope presents all the 32 photomicrographs (at 25% of their original resolution), with permission from Barrie Schwortz, and are copyrighted as noted on the Shroud Scope. There are more documentation on the sindonology.org web site about these photomicrographs and other existing photomicrographs which I do not have access to. Thanks for the prompt reply, Mario. I shall take another look at your site to see what I may have missed previously re the complete Mark Evans archive. For now, the chief point of interest to this data-starved researcher is your reference to 25% resolution of the Shroud Scope images. Is that a reference to the Durante photomicrographs? Was that a condition imposed by the Turin authorities when you first approached them to release those images? Why would they do that? 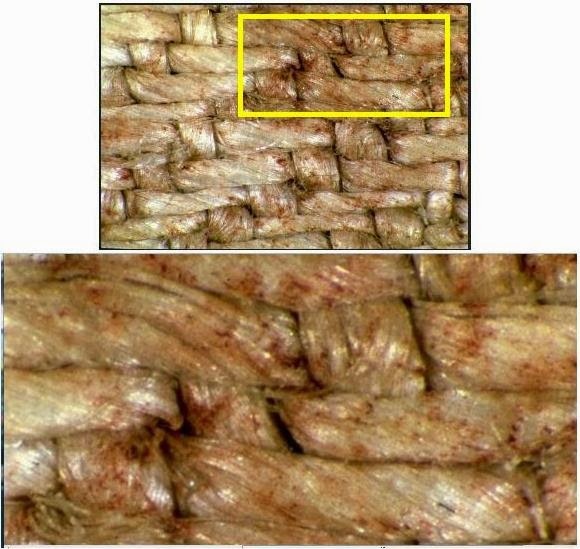 I for one would greatly appreciate having blood v body image at the highest possible resolution in order to see precisely where those blood (and body) images are located relative to the ribs, furrows and obverse side of the herringbone weave. Do you think the higher resolution images, if available, might help to resolve outstanding issues re superficiality, blood migration across the weave, whole v partial nature of the blood stains Mario? If so, then I would urge you to exercise your influence and good offices where the Turin and other authorities are concerned with a view to getting the highest resolution micrographs placed into the public domain. The 25% resolution applies to the Mark Evans photomicrograph collection (32 photomicrographs available from Barrie Schwortz), not to the Durante photograph. I do not have access to microphotographs (digital version) from Durante. Note: I have curated the data from Barrie to determine their location on the Shroud as best as I could. The photomicrographs layer is active when you use that link: each green square corresponds to a photomicrograph from the Evans collection. The only access I have to the recto images is from these books published in 2001 and 2002 (three such books). I do not know of any researcher that have accessed to the digital higher resolution images of the recto images. This is a pity. Am I the only one to find I initially understimate the wealth of detail that is available on Mario’s site? Take those thumbnail Mark Evans images referred to in the first of Mario’s links above. At first sight, one could be forgiven for thinking they are a repetition of the images that appeared in TH’s pdf. But there’s a difference, due partly to format. Not only do those images on Mario’s site expand to full screen when you click on them, but one can then magnify them further with repetitive clicks (up to 8 on my laptop) with CON+, with no appreciable loss of resolution. Here’s a before- and after-comparison of what one sees with just one of Evans pictures (small of back with blood). But there’s a sting in the tail. Suppose the kind of image you see above had been available before STURP set off to Turin in 1978. Would the protocol have been content for STURP member A to take sticky tape sample of blood regions back to the States to be examined and interpreted by STURP members B and C, resulting in seemingly conclusive mantras like “no red blood cells” and “not whole blood, but a serum exudate of retracted blood clots”? Look closely at those photographs. What was needed (surely?) was a separate lifting of the TWO kinds of pigment one sees in the magnified pictures – the denser spots of dark red pigment, and the diffuse much paler red regions. Might remnants of whole red blood cells have been seen in the first of those one wonders? Might it be the second that is better described as more serum-like, albeit with some accompanying pinkish porphyrin pigment due to haemolysis? Then there’s a second question that needs to be addressed. Is the ‘patchiness’ a faithful record of the initial imprinting. or were the dark red areas far more extensive originally,prior to having subsequently flaked off over the centuries? In that view, all we see now are the surviving patches of ‘whole’ (?) blood dotted about here and there that are anchored more firmly. Roll on STURP Mk2. Autumn (‘fall’) 2016 would seem a realistic target date, once the 2015 tourists are all safely back at home. The bloodstains you mentioned, coming from the front on the side of the face, cannot be coming directly from the scalp, because these bloodstains are far away from the scalp. This is because as I have shown, the hair where those bloodmarks seem to be (and actually are) are closely bounded to the scalp. I checked it using my own head and tape measure. The results were comparable. This has far-reaching implications! Actually I have performed a lot studies in this topic and gathered large material. I am thinking about preparing a paper discussing those issues, had I only some spare time. Oskar, there is a basic misunderstanding. The word scalp means “the skin covering the head, excluding the face”. When I wrote “the front on the side of the face”, I really meant the side, not near the top of the face. It was a specific discussion of the few rivulet-looking blood stains on the side of the face. They certainly cannot come from the scalp. Perhaps from the cheek as you wrote, not the scalp, but I do not think this is the case either, explained at length in the paper that the Shroud was not flattened I presented at Dallas in 2005. And even more so with the explanation of the difference of the amount (density) of blood transferred as I discussed in my previous comment. Mario, to avoid misunderstandings we must precise what are we talking about. I am not certain whether our views are similar, or different. It was a specific discussion of the few rivulet-looking blood stains on the side of the face. Do you mean side of the head (cheeks area, ~90 degrees from the nose) or frontal (face) side of the head? Because we may understand the term different. They certainly cannot come from the scalp. Perhaps from the cheek as you wrote, not the scalp, but I do not think this is the case either, explained at length in the paper that the Shroud was not flattened I presented at Dallas in 2005. In fact, this is the case, but, this does not contradicts your 2005 paper, in fact only strenghtens it. I definetly agree that the Shroud was not flattened -it couldn’t have been But this does not exclude the bloodmarks in the cheek area -and the presence of hair there also. Yellow line is the flat reference surface (flattened Shroud, which we reject). 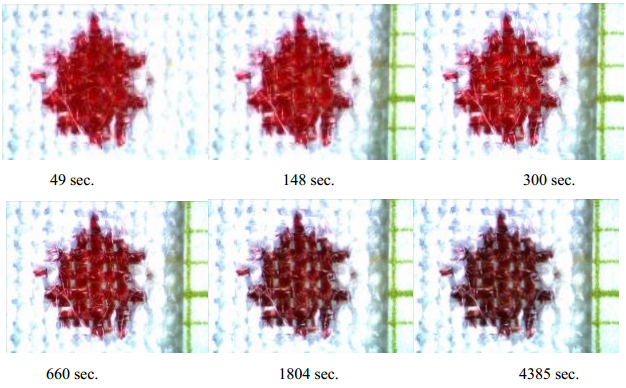 Red line is the Shroud in strict contact with the body -the contact image (which leads to consideable distortions, so we reject that hypothesis). Blue line is the Shroud being stretched while wrapping the face. This is the most likely position of the Shroud while the body image was created -leading to moderate distortions. That’s what you have shown in the paper. 4. Projection via the lines of the closest distance between body and sheet. You conjectured that the most likely projection mechanism is 4. Yet, in your paper you assumed 1. for its simplicity. Most people also assume mechanism 1. (verical projection on the sheet), even not being aware of the problem. It appears to be “natural”, so most people adopts it by default. But this leads to considerable delusion, if any other mechanism is correct. If other mechanism of projection than vertical is invoked, the results on the flat sheet would be different. For example 4. We apparently see hair being a few centimeter to the side of the face, separated from them by dark areas. But this is illusion! If you take some measurements via Shroud Scope, and compare it with meauserents perfromed on a living men, using simple elastic tape measure (which reflects approximately the shape of the linen wrapped around the face), it is obvious that the hair must be next to the face. This is further strenghten by the 3D relation -the intensity of the hair area is similar to that of the face. Further, if you eliminate dark bands, it is apparent that the image is continuous between the face and the hair -thus clearly showing that the hair must be closely bound to the sides of the face. No other option. The only solution is the presented Mask of Agamemnon. It was once normal mask, a 3D block covering the normal face -but was forcefully flatten by collpasing roof. Similarly, the Shroud once wrapped 3D shape -a 3D head. But as the sheet is flat due to its nature, the resultatnt body image is distorted in a similar way the Mask of Agamemnon is. You need some 3D imagination to correctly perceive it +plus perhaps digital elimination of bandings. Their use by the Shroud Creator to give us impression of looking at undistorted face is absolute masterpiece! Can the frontal bloodstains come from the hair? Note: A demonstration that the blood stains can come from the skin is not a proof that they cannot come from the hair. All head marks or just specific ones? Not a challenge, just interested in your viewpoint, i.e. other blood marks (located on head or other areas) were originally there, and touch ups, additions were made, or do you believe all blood marks were applied, added on? If certain ones, is this based on color differences or mainly flow pattern/just doesn’t look right? No bait trap involved, just interested in your opinion. If touch ups, additions in only certain areas, this would be relevant to the color issue(s), specifically as it pertains to the influence of the (processed, treated) cloth on the blood appearance (van der Hoeven). As mentioned in the STL presentation (mine), technically the previous studies only demonstrate that primate (human) blood components are present, with the exception of one other species (serendipitously), they don’t evaluate the possibility that non-primate blood components from other species might be present. Not a criticism here, it’s just the nature of the particular experimental design. This could be done serologically (using antibodies) and there are ways to set it up that help to minimize the amount of sample required. A potential spin off benefit of DNA analysis is sequence data of specific genes (that differ in certain regions among various species) could possibly address this as well. Anyway, was just wondering if you thought the touch ups were selective, and if so, which ones. Aren’t there are lot of assumptions being made/dismissed here, variables to be considered that at least place this is the grey area? For example, could sweat, grime, dirt have any influence on blood flow? Hair sticking (even lightly) to the skin? What about handling of the body? Could wrapping a facecloth over the head disturb anything? Cradling/handling the head when taking the body down? Supporting the head while placing the body in the cloth? Was the face washed/wiped in any way? Was the hair anointed with any oil, smoothed out? Is it remotely possible that a spiral type pattern in this area could be the result from any of this? Or must it simply be painted on because it just has to be? Is it valid to assume that the blood patterns here were completely unperturbed? Is it really that black & white, either way? I remember you that this is the alleged trace of a wounded head resting on a cloth, that puts pressure on it. Dr. Baden said that that is impossible. I don’t need seven years of study of medicine to absolutely agree with him. I have two children and I have seen and healed some wounds along my life. In any way, my objections would be overcome if someone can put here a similar case to the Shroud with similar traces. Hello all! Glad to see you all are well and fine this morning. This will be my first time commenting on this blog (I have little knowledge in science, so I hope its ok that I post here! I come here in pure ignorance, hoping to learn from responses and educate myself further on this subject)! I’ve been watching it since I discovered the shroud in November 2014. Ever since then, I’ve been completely hooked on the mystery of it all. I’ve watched and read almost everything I could on the shroud, from Mr. Barrie Schwartz to Russ Breault. I’ve read some of the papers from the late Dr. Alan Adler (May he rest in peace) and John Heller, Kelly Kearse, the late Raymond Rogers (May he also rest in peace), and Giulia Fanti. I try to understand as much as I can when reading these papers, but some of it just goes over top of my head unfortunately. Sometimes I have to pick words out and look them because I want to understand the science behind this shroud better. This specific article has caught my attention. As I stated, I come here with the opportunity to present my opinions and learn from them best in the shroud world. Ever since I watched Mr. Breault’s “What If”, I think he actually poses the greatest question to the Shroud of Turin. What if this is actually authentic, and we did nothing with it? Which of course, we are doing all we can! When it comes to my personal opinion, I believe we are staring the divinity of Christ right in the face. The evidence alone is astounding, and its hard for me to believe that some people completely rule the shroud out from being authentic because of the carbon dating. But, that discussion is for another time. My few questions deal with the blood and blood shapes, mostly from the few things i’ve read from the comments. I thought the blood was confirmed to be human male blood of the AB group? I remember reading that Dr. Adler said that it was “Primate”, but that Prof. Baima Bollone confirmed it to be human AB blood? I also believe that the blood on the front of the head to be genuine, from personal experience of having surgery on my head while I was awake. When I was younger, I use to have long hair (Maybe as long as the Turin shroud man’s hair, maybe slightly shorter.) and not only did I have blood matted in my hair, but it also flowed in nice rivulets down the side of my face. I would imagine that, if they carried this man from the cross, it would of been down while he was in the shroud, which could of possibly of caused the blood to look the way it is on the shroud? 1. Human male blood-this is based on the DNA sequencing results reported by Dr. Garza Valdes in his book, the DNA of God. In these studies it cannot be determined if the DNA signal originates from the blood sample or is due to contaminating, exogenous DNA. Partial sequence of a hemoglobin subunit was also reported (same study)-this doesn’t help, this gene is expressed in other cell types, including skin cells. Only real scientific conclusion that can be made here is there is human DNA on the Shroud. Is it human male blood? Still unknown (my opinion). AB group-this is based on the studies of Baima-Bollone, published in a Shroud specialty journal. Two different methods were presented, forward typing & reverse typing. Reverse typing is especially problematic in aged samples. Two complementary tests are really needed for a firm conclusion. Forward typing results suggest AB, but needs to be confirmed by additional methods (my opinion). Professor Baima Bollone confirmed it to be human AB blood-the antibodies BB used were raised against human proteins, however, such antibodies, especially those in use at the time, are infamous for cross-reacting with the same molecule in other species. This has to be tested directly for any antibody that is used.. Cross-reactivity was experimentally addressed by Adler, hence the designation “primate.” This issue was never explored in BB studies (at least not reported). It is a very safe assumption that such antibodies cross-react with molecules from similar species. The designation on the label of such antibodies “anti-human” only refers to the particular protein the antibody was made against. Cross-reactivity has to be directly examined. It’s very similar to having your own house key and feeling very good about it as you lock the door, but then four people show up and three of them have different keys that also open your front door. It can be a game changer. By beating the primate drum, I am not endorsing the idea that a forger rounded up a barrel of monkeys for his or her use. I just don’t think conclusions should be stretched beyond what the data truly show. Ha, I can say that I couldn’t fathom a forger either rounding up monkeys for this shroud either, especially without any real knowledge at the time that humans and monkeys even shared almost common DNA. Its even harder for me to imagine a forger at all making this shroud without its already mysterious properties, but that is a discussion for another time. My question is then (unless I misunderstood you), if we are not sure it is human male blood, what would be the chances that it would be? I think yes. Look at the photo of bloodied gentleman I posted. Aside from the rivulets on his skin, there are some dense bloodmarks in his hair, similar to what we see on the Shroud. It is not a binary situation (either from the hair or from the skin). Actually they come from both skin and hair. The blood marks on the face side are actually in the positions indicated by Lavoie, in the cheeks.But the hair are also in this area, tightly bound to the face. What misleads people is the misconception that hair are away from the cheeks. Actually they are exactly on the cheeks. The blood not only flows down on the skin of the cheeks, but also seeps and leaks through the hair at the same time. You can see the conception on the diagram I posted above. A little bit of imagination in 3D and you’ll catch what I mean. Oskar, you answered the main point I was stating: these virulet-looking bloodstains can come from the hair. Thibault disagree because he says it is impossible. I would like to see some proof of that from Thibault. I understand your skin/hair explanation, but this is another subject that is somewhat unrelated to the Lind and Antonacci paper of this post. I think it is better to concentrate on that paper: is the main point made in that paper right? The main point? Which one? That the blood marks we see on the Shroud could not have been transferred there naturally? I think it is not right. Yes, the main point is what is stated by the paper of Lind & Antonacci. Their main point is that the bloodstains we see in the hair cannot have come from the hair. Then they build their scenario around that statement …. I don’t know, suppose it depends on one’s viewpoint. If the Shroud is authentic, both must be true. If the Shroud is not authentic, both, one, or none could be true. As the blood classified as at least primate, it certainly makes it more favorable, consistent, more likely with the possibility that it’s human. That would certainly be the most reasonable explanation. Male vs female from existing data??? I think certain variables (sweat, dirty, handling, etc.) could have an effect on the appearance of a bloodstain. There are several books by Ricci who diagrams blood flow patterns relative to the Shroud; I remember one section in particular where he illustrated how handling of the feet could influence the overall appearance of the stain. Dr. Baden says its impossible. Other physicians, pathologists say the bloodstain appearance, pattern its well within reason, nothing abnormal jumps out out them. What to do there? Being relatively tall and prone to sudden bursts of jumping upward in low places, I frequently lacerate my scalp-seems to be quite a bit of variation regarding blood traces-not always exactly the same. (no hair involved). I suppose Jackson working backwards with colored-in bloodstains on a cloth wrapping a model of the body (to illustrate alignment, conformity) isn’t quite what you’re looking for. Yes, would be nice if someone recreated similar traces to match the Shroud to address these types of objections. Effectively. Other pathologists and sindonists have dealt with the subject. I know the work of Fanti and Lavoie. But they only speak of the frontal face. And they implicitly accept the point of Dr. Baden (blood don’t run on the hair by forming perfect rivulets) since they hypothesize about the formation of the image just to separate the blood trickles of the hair. A/¿En qué frase utiliza Michael Baden la palabra “impossible”? “..if the Shroud is genuine, the body must have been washed”, “..if the body was washed there might be some oozing from the wounds”. Porque son muchos los factores que inciden en el comportamiento que va a tener la sangre. D/ ¿”Rivulets” en el cabello? ¿Son realmente “rivulets? Me estoy refiriendo a las manchas de sangre que aparecen a ambos lados de la cabellera a la altura de la rotura de la nariz. Las manchas de la nuca no merecen ese nombre. La palabra “rivulets” sugiere continuidad y esa continuidad es inexistente. Los supuestos “rivulets” son discontínuos, manchas separadas, mucho más en el lado izquierdo que en el lado derecho. Y Gilbert Lavoie las ve como una serie de manchas separadas (yo tambien). “Rivulets” son los que muestra la magnífica fotografía que nos ha enseñado O.K. E/ Pero es que esas manchas separadas a las que me estoy refiriendo no están en el cabello…..están en la cara. O.K. mide (magníficamente) 9 cm entre la punta de la nariz y el supuesto rivulet derecho. Medidas que parecen incompatibles con que esas manchas de sangre estén sobre el cabello. Carlos: You are trying to be so subtle with words that you get yourself involved in the mess. (Te haces un lio). “Porque son muchos los factores que inciden en el comportamiento que va a tener la sangre”. And so on. Words don’t mean what you have decreed they mean. First it should be noted that only a small amount of total blood spilled has actually been reflected on the Shroud. This is clear conclusion from Lind & Antonacci paper, as well other works. If the blood is old and already coagulated, it doesn’t get reflected on linen. So only the most fresh bloodmarks, created just before (or shortly after) death could have been reflected. This mean that the Shroud image doesn’t reproduce the full amount of blood present on the body -in fact only small percent, which may be misleading. Presumably whole body and hair were covered with blood. So I adjusted color balance of the photo of wounded gentleman -but exactly in opposite way to what David Mo has done, reducing amount of red, and showing only the most prominent blood tracks. As to the front side it is clear that the blood marks in the hair are actually quite small -the measurement in Shroud Scope gives them about 1-3 cm in lenght, and 5-6 mm in width at max (see http://www.sindonology.org/shroudScope/shroudScope.shtml?zl=5&image=3&lon=1366.0&lat=5517.0 ) For my eysight this is very comparable to the blood trickles in the hair of that poor gentleman, and not to the long, wide rivulets we see on his cheeks and neck. As to the backside, the blood flecks on the Shroud are also up to 3 cm long, and less than 1 cm wide. ( http://www.sindonology.org/shroudScope/shroudScope.shtml?zl=7&image=3&lon=2069.0&lat=6950.0 ) Those are not long continuous rivulets, rather some large, dense drops or puddles trapped between wounds and hair. The body was in rigor mortis when it was taken down from the cross (the head is hanging down and not flat). Rigor mortis takes anywhere from 3-12 hours to set in and the blodd would have been very dry. Neither the arrows you made point to the darker parts of the blood nor there is a single trickle with a spiral form neither on the hair nor out to it. Who knows what is going on your mind. Usted es INCAPAZ de ver los 8 ó 9 “rivulets” que se inician en la zona lesionada (y algunos llegan hasta la oreja en la fotografía), y sin embargo ve INEXISTENTES “rivulets” en la nuca del Hombre de la Sábana. ¡Un problema! Where are you seeing a trickle as this one on the hair of injured man? Where are the marks of the blood soaked locks of hair that cover all the surface of the high part of the head near de wound in the Shroud? Why you can see the trickles of blood (? ) and not the marks of the locks? Have you any rational explanation for this (not vague statements, please)? Yes. I have a problem. I am discussing with people that “see things”. ¿Dónde están en el sudario las marcas de los mechones empapados en sangre que cubren toda la parte alta de la cabeza junto a la herida? ¿Por qué puedes ver regueros de sangre (?) y no las marcas de los mechones? ¿Tienes una explicación racional para esto (no vaguedades, por favor)? Sí, tengo un problema. Que estoy hablando con gente que “ve cosas”. ¿Por qué insistes en “engañarte”? Has dado una apariencia de continuidad , que es INEXISTENTE en la Sábana, a esa imagen que sitúas en una esquina de la nuca. En la imagen frontal de la Sábana las manchas de sangre están sobre la piel del rostro, no en el cabello. Te lo expliqué, también te lo explicó O.K., pero tu no quieres entenderlo porque es contrario a tus intereses. 3-“¿Por qué puedes ver regueros de sangre (?) y no las marcas de los mechones?¿Tienes una explicación racional para esto (no vaguedades, por favor)? Yo veo las “marcas de los mechones” pero las nombro correctamente como lo que son, “regueros de sangre”. Esas “marcas de los mechones” es sangre vehiculizada por el cabello (y no por la piel del cuero cabelludo) que ya ha iniciado la coagulación en su periferia, y varios de ellos han “alimentado”, como regueros, riachelos o “rivulets que son, la sangre que aparece en torno de la oreja y que al acumularse forma nuevos regueros sobre la piel del cuello y de la cara en los que no pueden formar “marcas de mechones” ……..entre otras varias “cosas” por carencia de mechones. Creo que el “súmumm” de “ver cosas” es gloria que deben ostentar con pleno derecho los escépticos, capaces de ver en el Hombre de la Sábana una imagen del medievo tardío o del inicio del gótico…. (¡con la gran cantidad de imágenes que en general habéis visto!. (“Son of man, thou dwellest in the midst of a rebellious house, which have eyes to see, and see not; they have ears to hear, and hear not: for they are a rebellious house”. Ezequiel 12:12). Stop with the Crowd Funding of Shroud of Turin Movies and Such Television: An Italian Professor believes he has the answer.